Structure of Hirudin in complex with Thrombin. During his years in Birmingham and Edinburgh, John Berry Haycraft had been actively engaged in research and published papers on the coagulation of blood, and in 1884, he discovered that the leech secreted a powerful anticoagulant, which he named hirudin, although it was not isolated until the 1950s, nor its structure fully determined until 1976. Full length hirudin is made up of 65 amino acids. These amino acids are organized into a compact N-terminal domain containing three disulfide bonds and a C-terminal domain that is completely disordered when the protein is un-complexed in solution. Amino acid residues 1-3 form a parallel beta- strand with residues 214-217 of thrombin, the nitrogen atom of residue 1 making a hydrogen bond with the Ser-195 O gamma atom of the catalytic site. The C-terminal domain makes numerous electrostatic interactions with an anion-binding exosite of thrombin, while the last five residues are in a helical loop that forms many hydrophobic contacts. Natural hirudin contains a mixture of various isoforms of the protein. However, recombinant techniques can be used to produce homogeneous preparations of hirudin. A key event in the final stages of blood coagulation is the conversion of fibrinogen into fibrin by the serine protease enzyme thrombin. Thrombin is produced from prothrombin, by the action of an enzyme, prothrombinase (Factor Xa along with Factor Va as a cofactor), in the final states of coagulation. Fibrin is then cross linked by factor XIII (Fibrin Stabilizing Factor) to form a blood clot. The principal inhibitor of thrombin in normal blood circulation is antithrombin. Similar to antithrombin, the anticoagulatant activity of hirudin is based on its ability to inhibit the procoagulant activity of thrombin. Hirudin is the most potent natural inhibitor of thrombin. Unlike antithrombin, hirudin binds to and inhibits only the activated thrombin, with a specific activity on fibrinogen. Therefore, hirudin prevents or dissolves the formation of clots and thrombi (i.e., it has a thrombolytic activity), and has therapeutic value in blood coagulation disorders, in the treatment of skin hematomas and of superficial varicose veins, either as an injectable or a topical application cream. In some aspects, hirudin has advantages over more commonly used anticoagulants and thrombolytics, such as heparin, as it does not interfere with the biological activity of other serum proteins, and can also act on complexed thrombin. 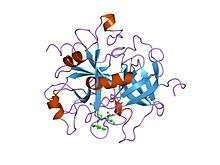 It is difficult to extract large amounts of hirudin from natural sources, so a method for producing and purifying this protein using recombinant biotechnology has been developed. This has led to the development and marketing of a number of hirudin-based anticoagulant pharmaceutical products, such as lepirudin (Refludan), hirudin derived from Hansenula (Thrombexx, Extrauma) and desirudin (Revasc/Iprivask). Several other direct thrombin inhibitors are derived chemically from hirudin. ↑ "Haycraft JB (1884) On the action of a secretion obtained from the medicinal leech on the coagulation of the blood. Proc R Soc Lond B 36: 478–487. - Open Access Library". www.oalib.com. Retrieved 2016-11-25. ↑ Folkers PJ, Clore GM, Driscoll PC, Dodt J, Köhler S, Gronenborn AM (Mar 1989). "Solution structure of recombinant hirudin and the Lys-47----Glu mutant: a nuclear magnetic resonance and hybrid distance geometry-dynamical simulated annealing study". Biochemistry. 28 (6): 2601–2617. doi:10.1021/bi00432a038. PMID 2567183. ↑ Haruyama H, Wüthrich K (May 1989). "Conformation of recombinant desulfatohirudin in aqueous solution determined by nuclear magnetic resonance". Biochemistry. 28 (10): 4301–4312. doi:10.1021/bi00436a027. PMID 2765488. ↑ Rydel TJ, Ravichandran KG, Tulinsky A, Bode W, Huber R, Roitsch C, Fenton JW (Jul 1990). "The structure of a complex of recombinant hirudin and human alpha-thrombin". Science. 249 (4966): 277–80. doi:10.1126/science.2374926. PMID 2374926. 1 2 3 Rydel TJ, Tulinsky A, Bode W, Huber R (Sep 1991). "Refined structure of the hirudin-thrombin complex". Journal of Molecular Biology. 221 (2): 583–601. doi:10.1016/0022-2836(91)80074-5. PMID 1920434. ↑ Fenton JW, Ofosu FA, Brezniak DV, Hassouna HI (1998). "Thrombin and antithrombotics". Seminars in Thrombosis and Hemostasis. 24 (2): 87–91. doi:10.1055/s-2007-995828. PMID 9579630.